Address : Javier Barrallo - E.T.S. Arquitectura. Plaza de Oñati, 2. San Sebastian 20009, SPAIN. The majority of the problems that CAAD deals with are located in contemporary buildings. But many other buildings of the historical heritage also need special attentions with their computer design prior to the restoration projects. Generally, in restoration work, hand drawing and artistic criteria have been more usual than work with precision topographic data and accurate technical plans. But a very rigorous design is not always enough to start restoration work. The real state that presents a historical building could have been modified substantially from its original state due to previous interventions, wars, seismic movements, erosion, biological aggressions or any other historical event. So, it is necessary to join CAAD tasks with a simulation of the historical process suffered by the building. Historical data and ancient cartography must be the basis of all the CAAD works, and the quality of the computer 3D model can be established comparing it with the original available maps. This paper explains the CAAD works and the intervention proposals for the restoration of the City Walls of Hondarribia, a small Spanish village placed in the frontier between Spain and France. These Renaissance bastioned walls were partially destroyed throughout many wars with France. The exact knowledge of their original trace and dimensions only is possible comparing the real CAD models with the plans that exist in the Spanish Military Archives since the XVIth. century. The digital store and index of all the historical information, their comparison with real photographs of the city walls, the creation of photo realistic images with the intervention proposals, and the influence of the structural repairs in the final project will be explained in the CAAD context. Hondarribia is a small village situated on the border between Spain and France. The city is surrounded by the Jaizkibel mountain, the Oiartzun valley and the Bidasoa river. It has had a very important strategic military role in the Spanish defensive system. Hondarribia (also called Fuenterrabia) takes its name from the Basque words ondar and ibaia, which mean sand and river. The old town is situated on a little promontory facing France over the Txingurri bay. Its buildings are a good example of the typical Basque architecture. Inside the City Walls, the Castle of Carlos V constructed in the Xth century, the Church of Santa María, of the XVth, century and the narrow streets still retain the medieval spirit of the ancient city. Hondarribia was first fortified by order of the Goth King Wamba in the seventh century. Since then, different besieges, fires and other misfortunes have beset the city. The most important happened in 1638, when 27000 French soldiers besieged the city for two months firing 16000 shells onto the population leaving only 300 survivors, most of them women and children. the whole city was virtually destroyed, but nevertheless did not surrender. One year later, the Spanish King Felipe III began to rebuild the walls. There was peace for the following one and half centuries. 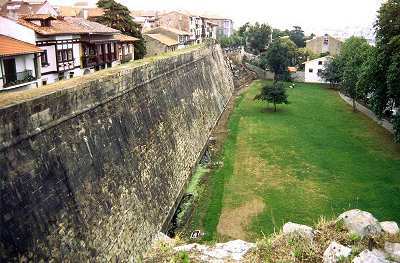 The city was rebuilt and the City Walls reinforced by the Spanish military engineers using the latest techniques of the moment. In spite of this, in 1792 the French army attacked the city again and conquered it. They won the battle conclusively when they breached the walls. After they took over the city, they blew up the walls with the help of German engineers. 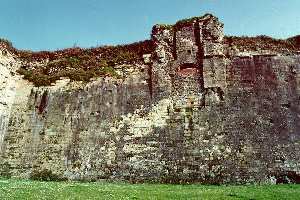 The whole part of the walls looking to France was destroyed. the remainder of the Walls escaped complete destruction thanks to the signature signing the Peace Treaty of Basilea. Although many rebuilding projects were devised, the changes in military tactics made the City Walls redundant, so they languished until our days without any care or maintenance. · Damage from the exploding mines made by the French army. As a mine consist of an explosive charge situated under or near the foundations, many large cavities belonging to non used explosive mines are still drilled into the walls. The degradation of the masonry construction and the stone facing. The inner part of the Wall is a lime mortar masonry, soluble in water and resulting in calcium carbonate. The stone facing suffers surface erosion and decay of material. As the level of the inner streets is lower, the drainage and other infrastructures have to breach the Walls to reach the outside. This infrastructure has been destructive and inadequate. Due to the citys position, river water is present in the walls foundations as rising damp. The water goes up by capillarity action worsening the degree of chemical and biological attack. The city walls themselves retain a huge amount of rain water having a double effect: one is mechanical, due to the load of water. The other is adds to deterioration due to biological and chemical attack. Plants and small trees inhabit spaces between the ashlar blocks. The roots even dislodge the stone masonry. The use by people have been unresponsive. The inhabitants of Hondarribia have built over the city walls, filling them with soil in order to cultivate covering of vaults and domes of the strongholds, and finally, they have used the walls as a quarry to obtain stones to build their houses. Much restoration work of historical heritage relies on obtaining of historical documentation about the studied monument, the compilation of data about previous restorations, the location of plans and ancient pictures, photographs and any other document about the monument that may contribute to study the evolution of the damage calling for the restoration. All this information must be completed with data obtained during the structural analysis: updated plans, detailed photographs, stress measurements, samples of the terrain, etc. When a Heritage construction, like the Hondarribia City Walls, has suffered a high degree of destruction and reconstruction throughout time it is difficult to determine a real model to direct the restoration works. 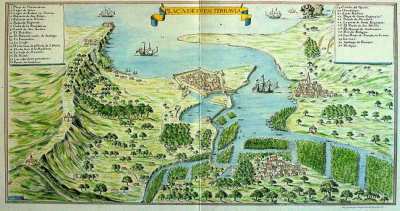 The first Hondarribia fortress of the seventh century? The city walls previous to the addition of the strongholds in the thirteenth century? The most magnificent walls in the seventeenth century? Then, should elements like bomb impacts or mine cavities remain in the city walls or should they be removed and restored? The answer is not easy and calls for careful studies of the history of the walls, the city, the inhabitants' traditions and way of life, the ancient pictures and plans, the structural state of the construction and a realistic economic estimation. After all these data were collected in the course of two years, we defined a model whose priorities were the safety of the structural state, the integration of the city walls as a part of the urban environment, the stocktaking of the war damage and the fight against biological agents. The volume of information in a restoration project is difficult to manage because of its quantity and the different physical sizes and formats of storage. In order to simplify the management and the access to this information we have designed a methodology of digital information storage and a software to navigate through it. This procedure has been very helpful in the works achieved in the historical heritage, featuring the facility to store and keep information securely and the simplicity to locate and study any historical data, survey or photograph of the monument. The system is programmed under Neobook Visual Programming, a very cheap popular and easy to use software, running under DOS or Windows in a Personal Computer platform. All the information managed by the system is digitally transferred by means of a Hewlett Packard 3c Scanner and Kodak Photo Disk. Photographic Library. Shows a complete photographic journey along the city walls and a detailed catalogue of damages. Ancient Documents. Includes historical plans, ancient engravings, old documents and early photographs of the city walls. Experimental Works. Here are related stress measurement, finite element method simulation, terrain analysis, crack measurement and topographic detailed survey. Intuition and a huge knowledge of the actual state of a heritage building is not enough to start with intervention. A prior structural analysis and a complete topographic survey must be made. But we cannot forget the historical analysis: bills, contracts and all documents relating to the repair to the city walls, contemporary construction manuals, plans, engravings and even ancient photographs. All this information joined together can give a complete view of the scope and aim of the restoration process. In the Hondarribia work, all the information concerning historical documentation, constructive analysis, environmental studies or experimental structural measurements can be found navigating through the computer application. 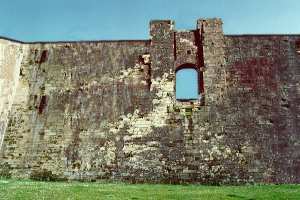 Thus, the damage of the city walls can be easily connected with historical information concerned with the warlike events that Hondarribia suffered in the wars with France. Photographs of the actual state can be compared with photographs of the beginning of the century. Ancient plans can be superimposed with new ones to determine modifications made on the Walls. Crack measurements can be compared with experimental and theoretical stress analysis. Another advantage of the system is the chance to include realistic pictures of the effects of the restoration prior to its execution. Below, there is an example of the virtual restoration of the Puerta de San Nicolás. We wish to thank the people and Municipal Government of Hondarribia for their help and financial support. 1. Gomez Pineiro, Javier et al. Documentos cartograficos historicos de Gipuzkoa. Diputacion Foral de Gipuzkoa, 1994. 2. Izaguirre Iguiniz, Martin. Cartografia antigua y paisajes del Bidasoa. San Sebastian, 1994. 3. Llobregat, Conde del. Fuenterrabia: Noticias historicas, 1913. 4. Portu, Florentino. Hondarribia: Notas historicas y curiosidades. Excmo Ayuntamiento de Hondarribia, 1989. 5. Sanchez Beitia S., Zulueta Goienetxea, A., Barrallo Calonge, J. 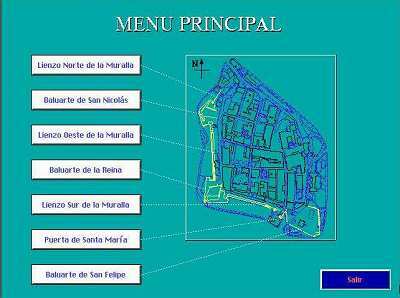 The Hondarribia City Walls in Structural Studies, Repairs and Maintentance of Historical Buildings. Sanchez-Beitia S. and Brebbia, C. A. Editors. Computational Mechanics Publications. Southampton, 1997.